The town of St. Albert is a hot bed of arts and culture, expressed in various places. The visual arts studio, public art galleries and local painters guild are all artistic outlets. 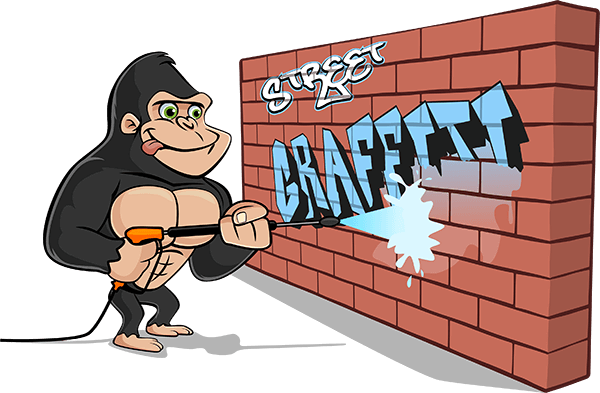 Living in such an artistic environment, there is bound to be some spill-over onto street level and that is when you call our Gorillas for your St. Albert graffiti removal. Graffiti and vandalism has never been more popular and that is because it has never been easier to carry out. Aerosol paints are easily transportable and available at any hardware store and unsuspecting canvases are a dime a dozen, put these two together and it doesn’t take long for a town to become overrun with paint and tags. Fully removing these stains and even keeping up with them can be a pain for anyone – but not our Gorillas! The expert technicians love to be busy and we are always looking for new clients for our St. Albert graffiti removal. Instead of having to deal with paint sprays or eyesores, our local Gorillas can bring your property to its former glory in a timely manner. When you find yourself facing off against graffiti on your home or business, whether it is a one time hit or multiple occurrences, our Gorillas are only a call away! Instead of putting your St. Albert graffiti needs on the back-burner, Gorilla Property Services has adopted a ‘divide and conquer’ philosophy, splitting our local technicians into grids. This system allows us to give your property the time it deserves and the results that you need! With Gorilla Property Services on your side, you don’t have to wait for your St. Albert graffiti removal! Call today to book an appointment for your graffiti removal today and let us show you what we can do.